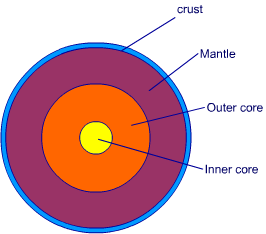 The earth is made up of several concentric layers. Concentric means having a common centre. The earth has one layer inside another. The thinnest of all the layers. About 35 km on the continental masses and only 5 km on the ocean floors. The continental mass is also called ‘sial’. The name sial is derived from letters ‘si’ of silicon and ‘al’ of alumina. The oceanic crust is called ‘sima’. The root of the word sima is ‘si’ from silica and ‘ma’ from magnesium. It is the layer just beneath the crust and extends up to a depth of 2900 km below the crust. The innermost layer is also called ‘nife’. The name nife is derived from the word ‘ni’ from nickel and ‘fe’ from ferrous meaning iron. The temperature and pressure of the central core is very high.